The set-up is remarkably simple: Twelve people meet in an abandoned warehouse to transact a gun deal. The kicker, though, is that the film isn’t simplistic. This isn’t just any group of people. Some are strangers to others in the group. Some are longtime business partners. Some have coincidental connections to each other. The entire deal hinges upon the disparate personalities of its participants. Some of these people are psychopaths. Others simply want their money and to leave peacefully. None of them anticipates the wrench thrown in the works. Co-writer/director Ben Wheatley’s Free Fire is a masterful example of simplicity in plotting that has a surprising amount of anger simmering underneath the surfaces of its characters, readying to boil over the sides of this heightened conflict. Wheatley and co-screenwriter Amy Jump provide a cadre of personalities, and this secretive deal, as with most deals of this nature, is built upon the assumption that these men (and one woman) can behave themselves. The assumption is the wrong one, and that is where the central conflict of this story receives a lot of its surprising nerve. Lest it seem the film is a joyless excursion, be reassured, reader, that this is quite the rollercoaster. The key is in Wheatley’s formal approach, which lives or dies upon the decision to set almost the entire exchange (apart from the prologue, which, in any case, is set outside the warehouse and within a van about to arrive at it) within the walls of the warehouse. This surprisingly doesn’t hinder cinematographer Laurie Rose, whose utilization of light, shadow, and elegant movement within the confined space is stunning. The beats of the editing (the director and his co-screenwriter) are stunning during the extended gun battle, and the sound work is spectacular and immersive. Somehow, we’ve gone this long without mentioning those characters. They are a motley collection: On one side, the players are performed by Cillian Murphy, Brie Larson, Armie Hammer, Jack Reynor, and Michael Smiley. On the other side are Sharlto Copley, Noah Taylor, Sam Riley, Enzo Cilenti, and Babou Ceesay. Copley's Vernon is a squirrelly nut and an openly sexist louse toward Larson’s Justine, Hammer’s Ord turns out to be the only one here with any detectable weapons training, and Riley’s Stevo and Reynor’s Harry had an unexpected quarrel the night before a deal in which neither knew the other was taking part. It’s an explosive and implosive mix of total coincidence, warring personalities, pent-up anger and frustration, and several unforeseen complications (none of which will be revealed here), and in this confined space, that makes for great drama and for terrific ammunition (pun fully intended) in an extended sequence of controlled chaos. These performances show utter precision, especially from Hammer (a hoot as the unknown variable in the group) and Copley (who adds something more than blustering gusto as the wimp disguising himself as the tough guy). The violence is brutal: These guns have real firepower, and Wheatley refuses to back down. 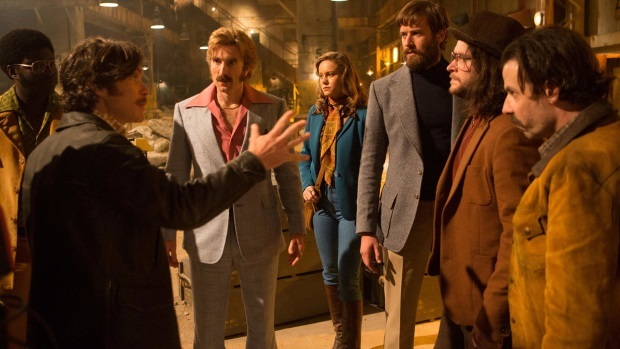 Free Fire is a lit match and a live grenade, a remarkably entertaining crime comedy stripped to its essentials. What a ride.